Works with an Reverse Osmosis Water Filter System - simple push fittings. Helps minimise the fluctuations of your body's pH. Turn acidic drinking water into alkali calcium ionic water. 100% organic and natural calcium, magnesium, sodium, potassium ions added. Makes water more easily absorbed into the body. 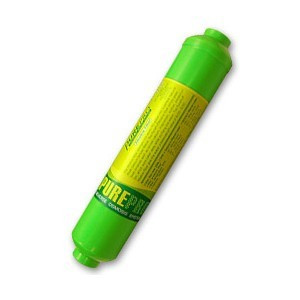 The PurePro Alkaline Water Filter Cartridge transforms the mildly acidic RO water into a perfect natural alkaline and calcium ionized water, improving both the taste of the water, giving the water a much softer feel. The PurePro Alkaline filter restores beneficial nutritional minerals lost in the filtration process such as ionized calcium, magnesium, sodium and potassium. It therefore makes the perfect add on to any reverse osmosis water filter system with universal compatibility. The alkaline filter is highly effective in raising the pH value of reverse osmosis or distilled water to between 8.00 and 9.50. Over acidity in the body is a very common today. Many people believe that a more alkaline pH in your diet and water is very beneficial for health. Well pH-balanced blood is necessary for the body to resist disease. A healthy body maintains adequate alkaline reserves to meet emergency demands. When excess acids need to be neutralised, our alkaline reserves are depleted leaving the body in a weakened condition. A pH balanced diet, according to many experts, is a vital key to health maintenance. pH enhanced water helps to minimise the fluctuations of your body's pH. 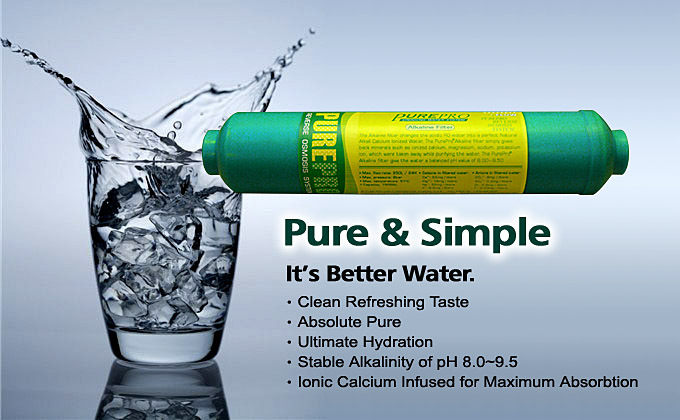 The 100% organic and natural calcium, magnesium, sodium and potassium ions produced by the PurePro Alkaline Filter can be 100% fully absorbed by the body. Despite the fact that water provides only a very tiny amount of our daily intake of these minerals, they are more easily absorbed in the body because they have structurally smaller molecules. This assists in helping the body absorb more water and replenish lost fluids quicker for much better hydration.